Today and for the rest of the week we are taking a bit of time off but have five short but exciting stock car short track racing film clips from around the world for you to enjoy today, thanks to British Pathe. Editors note: Starting today and on through to Monday we are taking advantage of a nice stretch of sunny and mild weather to do some necessary work in and around The Old Motor workshop. We need to shuffle five cars around here at the shop and prepare for the long winter ahead. While all of this is going on, we will be sharing with you a series of videos and shorter posts, and we will be able to post your comments. Things will be back up to speed on Tuesday morning with our regular coverage. Thanks for you support and patience. 1915 Duesenberg 16-valve racing car that placed 2nd at the 1916 Indianapolis 500. It later raced on the 2.5-mile Sheepshead Bay board track in 1917 and on oval tracks in the northeast through the 1920s. 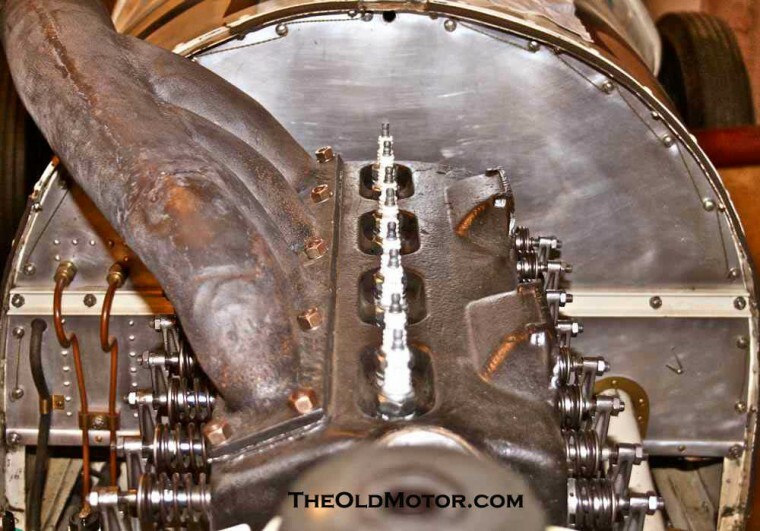 The four cylinder 16-valve engine has two intake and exhaust valves per cylinder and twin spark plugs. The valves are actuated by two camshafts and eight vertical 16-inch long rocker arms per side (intake on right, exhaust on left). In this view the cast aluminum valve covers are removed. All of this is to prepare for an exciting old racing car coming in this weekend: a 1915 Duesenberg with a 16-valve walking-beam engine. It is the only 16-valve four cylinder team car built by Fred and Auggie Duesenberg car to survive. The other is an eight-valve version that is in the Indianapolis Motor Speedway Museum. One other 16-valve engine has survived in the Klein Car. Learn a bit more more all of these fascinating Duesenberg racing cars here. We will be sharing this car with you in a feature at some point and hopefully a video of it in action next spring. It will be celebrating its 100-year anniversary of finishing in 2nd place at Indianapolis in 1916 next year. It may be going back to Indy for the first time since 2002 when it last took part in the pre-race festivities. This clip shows the rough and tumble action during a stock car race in Richmond, Virginia (1953). In Australia men and women battle it out on the NSW Windsor Rural Speedway (1955). Stock car racing comes to the Buffalo Sports Ground, Paris, France for the first time (1953). Matcham Park Stadium, in Bournemouth, England is the scene of a stock car race and an amateur brother and sister trill show (1958). The last film clip shows what the British call “Bump and Bang” racing. It was held on a portion of the world famous Brands Hatch circuit in Fawkham, Kent, England (1966).